Fred ‘Krugger’ Bertrand has a specialty: winning world championships. He’s taken home the Big One from the AMD show twice so far, and picked up multiple other awards too. The Belgian wizard is the master of the grand slam, pull-out-all-the-stops build, without resorting to peanut tanks or 30” front wheels. But what happens when Krugger turns his hand to a manufacturer commission—with strict orders not to apply the grinder to the frame, or loosen the engine bolts? 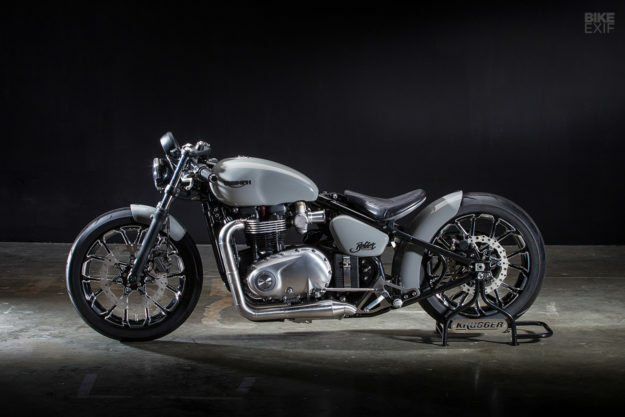 This hardtail Bobber is the answer, built for Triumph Benelux and infused with a touch of drag bike style. 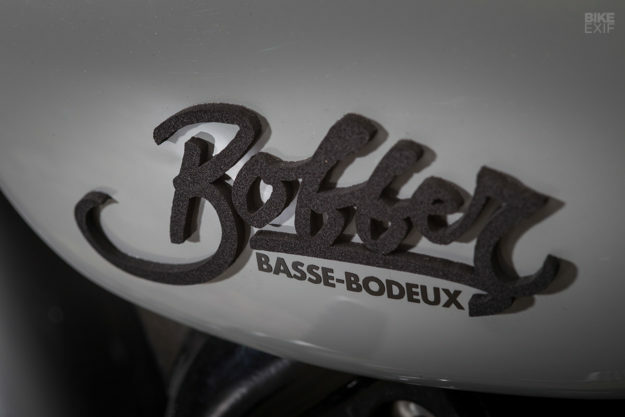 The story behind ‘Bobber Basse-Bodeux’ started at the end of 2017, when Triumph sent the fastest-selling motorcycle in the company’s history to Krugger’s rural hideaway. There was just one catch: the bike had to be finished before the 2018 motorcycle show season, which is starting right now. 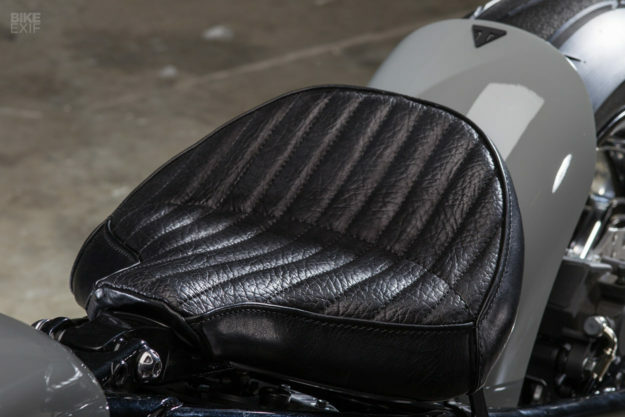 But despite this tight schedule, Krugger has managed to pack the Bobber with intricate details and factory-level custom finishing. To get the low-slung stance right, he’s shortened the fork tubes by just over an inch. He’s also lowered the fuel tank by 40mm, subtly redesigning it to sit closer to the engine block. The fuel cap has been centered and ‘frenched’ in too. They sound like simple mods, but it meant creating an additional tank to house the fuel pump. This one has been located under the seat, and is neatly hidden. Total fuel capacity has been increased from 9.1 to a most useful 16 liters and there’s a lovely touch with the logos on the main tank—they’ve been carved from Neoprene by the creative engraving studio Atelier 8185. The biggest change is to the wheelbase. It’s lengthened by 75mm, thanks to a custom-designed rigid hardtail setup. 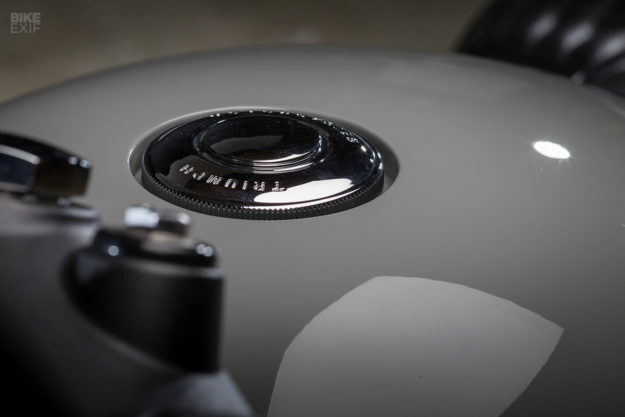 The rear end of the standard Bobber looks pretty clean, but this is even more minimal—because the cantilevered shock is gone. To get the seat to fit snugly against the frame, Krugger has reversed the support arm—a relatively simple solution that works brilliantly. The standard seat base has been recovered in a stunning black hide by Wildhog. Krugger has removed the air intake box, and installed beautifully machined velocity stacks for the ‘carburetors.’ The intakes are mostly for visual effect, but they’ve also allowed Krugger to push the side panels back by 50mm. 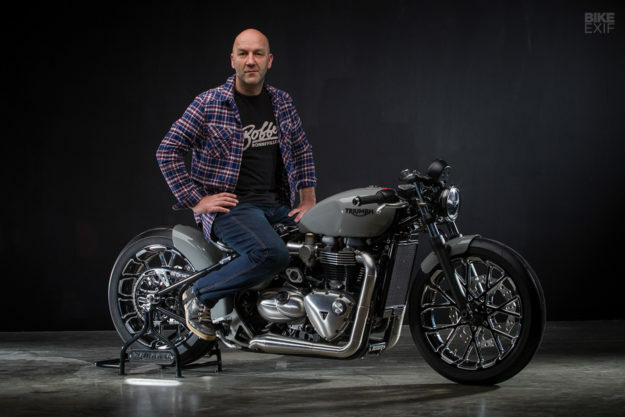 The Bobber is famous for its straight-line speed: indeed, the centerpiece of the launch event in London was an indoor drag race. Still, Krugger has freed up a little extra power via a custom INOX exhaust system, with 53mm diameter pipes and megaphone mufflers. Dyno tests have shown that even just replacing the cat with an X-pipe on the Triumph 1200 engine is good for a +5% increase in horsepower straight away. Krugger’s bike has been remapped, so we’re betting on an extra 10% (or more) power hitting the back wheel on this one. The wheels are 18-inch Arlen Ness alloys—3.5 at the front, and 5.5 at the rear, with matching Arlen Ness brake discs. 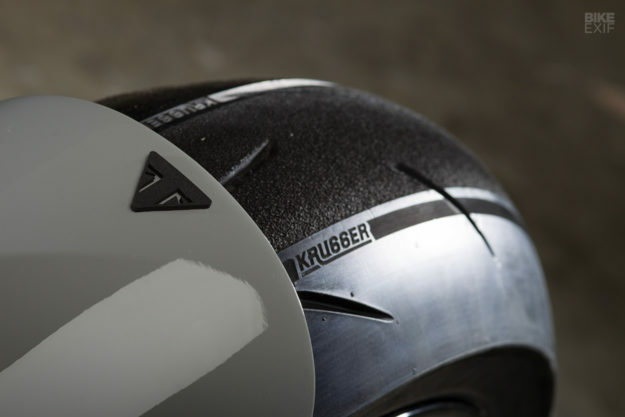 The tires are Dunlop’s super-sticky Sportmax pattern, with special ‘scarving’ and even the Krugger logo discreetly embossed—a trick we haven’t seen before. 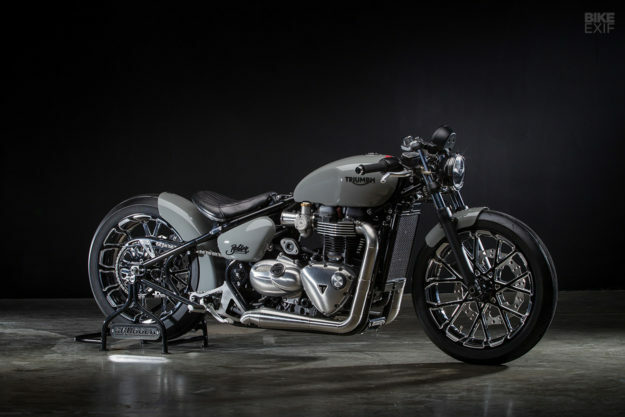 The rest of the Bobber is sprinkled with Triumph’s own accessory parts, from the grips to the LED headlamp with aluminum bezel—and even less noticeable hard parts like the oil plug, front brake cylinder cap and clutch cable brackets. The bars are standard, but have been inverted to accentuate the low-slung vibe. Once again Krugger has pulled it off. 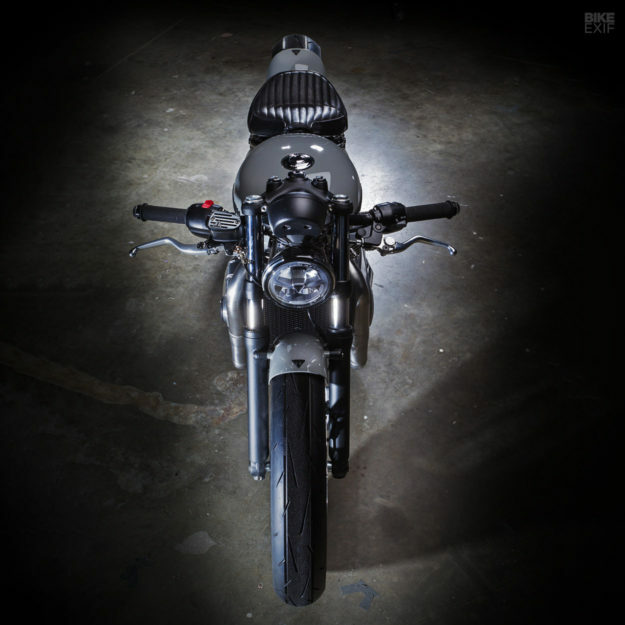 He’s proved that he can do more than wild show bikes, and can turn his hand to a streetable custom that looks like a million Euros but with relatively minimal mods—and without resorting to the grinder. 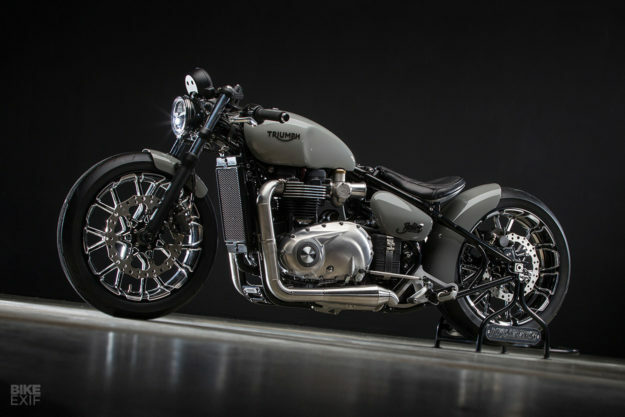 Krugger Motorcycles | Triumph Belgium | Images © Thierry Dricot 2017. Krugger would like to thank Triumph Motorcycles B.V., Dunlop, Qwart, Wildhog, Atelier 8185 , SBV Tools, Arlen Ness and Carrosserie Counotte.